Marine General John Allen seems to have joined the dark side after his ringing endorsement of Hillary Clinton during the DNC convention. His speech was politically correct to its core, leaving some veterans wondering if he lost his mind or forgot her failures. Or both. 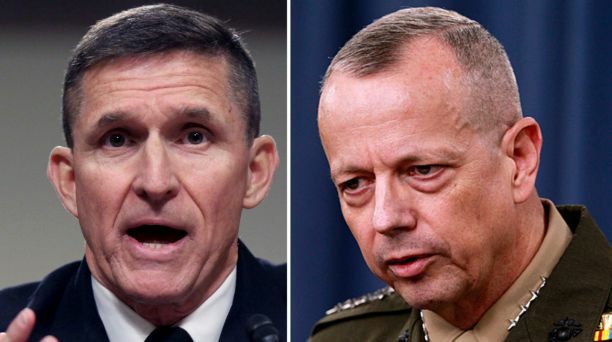 And not every General agrees with him, evidenced by Lt. Gen. Michael Flynn’s endorsement of Donald Trump. Then we can’t trust YOUR judgment, General. Hillary Clinton lied to Congress, lied to the FBI, lied about the emails, placed American assets at risk, by her inaction got people killed by jihadists, and failed to properly secure US facilities overseas…but you STILL trust her judgment? What have you been smoking? Her vision is not about a united America, it’s about division, racism, and giving the enemy exactly what they want…US. We the people will not go quietly into the night with her socialist/communist agenda. The forces of hatred were at the DNC convention, General.The continual hatred against police, against whites, and the pandering to our enemies…that’s chaos and that’s darkness. Hillary has been part of the problem, not the solution. General, YOU set the policy for defeating ISIS, and it failed miserably. As the FBI director said recently, there has been a “Terrorist diaspora” – you might have taken some land back, but the terrorists have scattered like cockroaches across the world. Hillary’s be-nice-to-terrorists philosophy has NEVER worked and never will. You can hug a terrorist all you want and you will just get beheaded. You can give them jobs and when they feel the time is right they will walk into a nightclub and murder 49 people. Or more. How can you defeat something, when you can’t even name it? How can you say we are strong when the rest of the world laughs at us for being weak? The “kinder, gentler” philosophy will never defeat those who wish to kill us.